The first step to understanding your aura is to know that you like all living things (plants, animals, etc.) are made up of a complex combination of atoms, molecules and energy cells which generate a large magnetic energy field that can be sensed, felt and even seen. This magnetic energy field is what is commonly referred to as your aura, think of it as your own personal energy field. Some of these layers follow the contours of your body while others form the shape of an oval or egg. When I talk about aura layers, the word layer might suggest that there is separation or isolation between them. This is a misconception as each layer interpenetrates and interrelates with the others beginning at the center of your being. 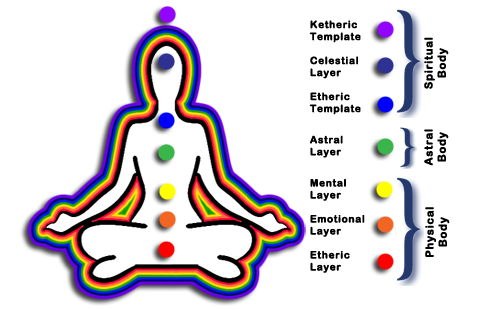 When you look at these layers going from the inside (etheric or 1st layer) out (ketheric template or 7th layer) the vibration of each level becomes finer and higher. Click on the individual links Right of the picture below to learn more about each layer. Click on the individual links below to learn more about each layer. Each layer is also related to the chakra of the same number. These energies make you what and who you are and in turn, are affected by your surroundings and life style. They reflect your health, character, mental activity and emotional state. Your energy level and the way you use any particular part of yourself also greatly influences the size of your aura. It is generally believed that your energy field emits out from the body approximately 60 centimeters (2 feet) to 90 centimeters (3 feet) on all sides. It extends above your head and below you feet into the ground. If you suffer from stress, have experienced trauma and emotional pain, it can show as distortions and blocks in your magnetic energy field long before they manifest as dis-ease in the physical plane, your body. Your whole energy system could uncover important resources that would enrich your life with new insight, growth and power. A special type of photography called Kirlian photography has even been able to capture the aura on film. Please take note that because of the diverse ways that the auric field is perceived and sensed all my comments and remarks about the auric layers are based on general agreement as well as my own experience but are by no means the absolute rule. Dis-eases are caused by the depletion, congestion or blockage of life force energy in your energy body. These abnormalities can be seen and in a lot of instances they are distinguished by certain colors seen in the different layers of your energy field. It is a good idea to protect and balance your aura from time to time this clears out any negative thought patterns and emotional blocks and also sets a shield of protection around yourself thereby assisting your body to retain much needed life force energy. Having a clear understanding of the anatomy of your aura will enable you to take control of your life, your well-being in body, mind and spirit. This is one of the things I teach all my students. I cannot even begin to explain how important it is for you to learn to do this for yourself. Your aura, more than any other single human trait, manifests the sum and substance of your existence as an endless life force in the universe. 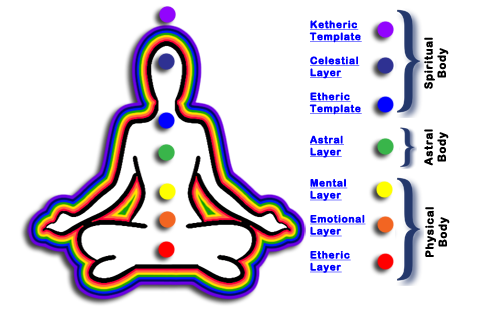 Give yourself the advantage today and do the Aura Color Test.